There are two non-profit organizations in Goodland that have been working towards bettering our small but mighty village. 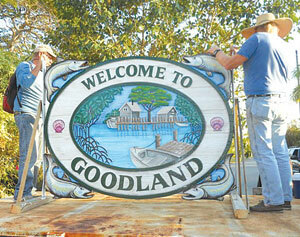 The Goodland Civic Association and the Goodland Arts Alliance not only take on specific community-related projects individually, but also recently collaborated on a project to repaint the hand-carved sign that greets visitors as they pull onto the curvy road from SR-92. The Goodland Arts Alliance is in its fledgling year, developed over the summer by 12 Goodlanders who wanted to shed more light on the multitude of artists, musicians and historians who call the .6 square mile island home. The GAA mission is simple: to preserve, promote, and advance the cultural presence in the Village of Goodland through art, history, and education. The Goodland Arts Alliance has worked closely with Collier County Parks and Recreation to help recreate MarGood Harbor Park into the artistic headquarters of Goodland. GAA artists will soon be displaying their artwork within the MarGood museum and future goals are to turn the four remaining cottages on the premises into working studios, stores or reenactment centers for the GAA to utilize. the day – no doubt collaborating with eachother for an audio experience. The Florida Water and Land Legacy will be there, encouraging registered voters to sign petitions towards re-allocating monies back to the Florida Forever Funds – state-designated monies that purchased MarGood Harbor Park in 2005. Other non-profits will also be there, and of course there will be food – lots of good, local food. Goodland Civic Association board members, President Joanie Fuller and Marziano Gizzi were the first of nearly the entire GCA board to join the GAA. 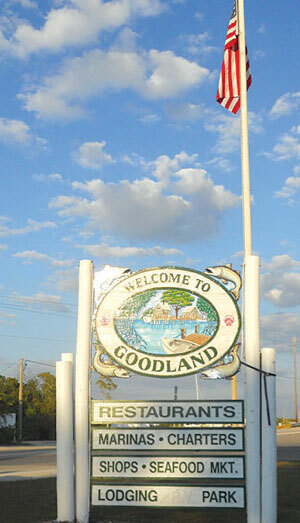 Fuller and Gizzi suggested that the two non-profits work together to re-paint the sign at the entrance of Goodland that was faded and peeling. The GCA would pay for the materials for the sign and the GAA artists would donate time to pressure wash, scrape off the old paint, re-paint and clear coat it. Gizzi stepped right up to get the sign moved to the workspace of GAA member and sign artist, Denise Santos. Gizzi spent days scraping off the old paint, calling on helpers when he could. Denise hand-painted the multi-layered sign with the help of Margie Fortune and Judy Wittwer of the GAA. time you drive by… the sign literally glistens in the sunlight. It’s beautiful. Joanie is absolutely right. After all, the goal of the GCA is to look out for the general welfare of Goodlanders and to promote community spirit and good will among residents. 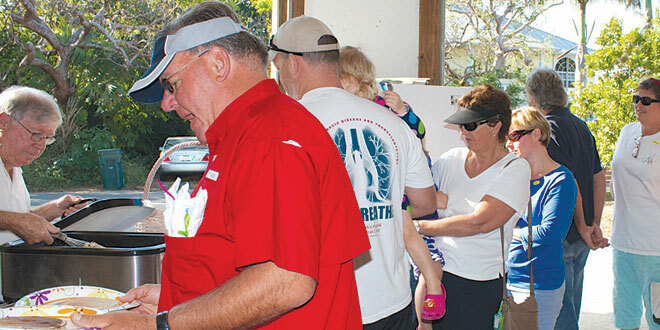 The GCA holds a number of annual events, including the Christmas Bazaar in December, two pancake breakfasts and an island-wide garage sale. The Goodland Garage Sale and the second Pancake Breakfast will be held on the same weekend – March 2nd and 3rd. The pancakes start flipping at 8:00 AM which also happens to be when the garage sale starts. The Pancake Breakfast lasts until 11:00 AM but the garage sale will continue throughout the day. Fundraisers are important for the GCA as they take on a lot of issues relating to working with the county and the City of Marco Island. year. This allows Goodlanders use of the park for the Christmas Bazaar in December, the Boat Parade in February, and one other weekend in March for Goodland’s Spring event. Recently, the GCA worked closely wth Commissioner Fiala in an effort to lower Goodland’s high water costs as they were, well, ridiculous. In December of 2012, the County Commissioners passed that the “Goodland Water District” would be enveloped into the Collier County district as a whole, saving Goodlanders from paying the tax on Marco’s purchase of the water treatment plant as well as lowering administrative fees. Water bills have been markedly lower in the last two months. The GCA has been working with Collier County Code Enforcement Supervisor, Kitchel Snow, who has offered to bring a dumpster to Goodland on March 4th, the Monday after th garage sale. This way, residents may get rid of any leftovers or anything else they may want to dispose of. It will be in place from 9:00 AM to 1:00 PM on that day only, but the position of the dumpster is yet to be decided. For an island of only 300 people, we sure do get a lot done. Much of it is thanks to the support of the county as well as those who come to Goodland and take part in our many events. 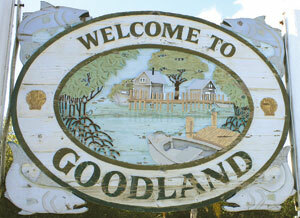 However, none of it would be possible without the volunteers who donate their time to make Goodland as GREAT as it is. So come see us March 2nd, 3rd and 10th! You won’t be disappointed.